Gurugram (erstwhile Gurgaon), a satellite town in the National Capital Region (NCR) and referred to as a ‘Millennium City’, is one of Haryana’s largest urban centres. It has experienced phenomenal growth – from a small population of 870,539 in 2001 to 1,514,085 in 2011. The current population of Gurugram is estimated to be close to 2.5 million and is expected to grow to4.3 million by 2020. As the industrial and financial centre of Haryana, this city has witnessed the third largest increase in per capita incomes in India (after Chandigarh and Mumbai). Almost 45-48 percent of Haryana’s revenue accrues from Gurugram by way of excise duty, sales tax, stamp duty and registration. This is the hub of the prolific and massive real estate development that is happening in the state today. Naturally enough, this explosive growth has brought in its wake concerns around sustainability. The question being asked is how can economic and social development be achieved without harming the environment, while improving the overall quality of life and well-being of urban dwellers. This Guidance Framework – prepared by Centre for Science and Environment (CSE) and Gurgaon First under the aegis of the Municipal Corporation of Gurugram – attempts to answer this: We believe it is possible to protect our air, water, soil, biodiversity and forests; promote sustainable mobility; and improve the living conditions of the poor even while meeting the needs of development, growth and poverty reduction. Effective intervention at the early stages of growth can be preventive, precautionary and cost-effective. 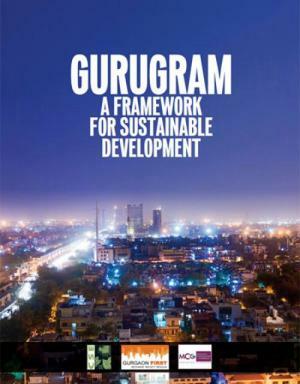 The Guidance Framework offers an action agenda for Gurugram to meet the sustainable development goals, by enabling greater efficiency in resource use; conservation of water, energy, materials and biodiversity; recycling and minimisation of waste and pollution; and allowing equitable access to resources. These integrated targets are designed to achieve the objectives of Sustainable Development Goals (SDGs) and the New Urban Agenda. They reflect the key guiding principles of both national and state-level policies related to resource efficiency and savings, and have drawn upon the lessons from best practices.